My Liberated Rainbow quilt is second in this row. 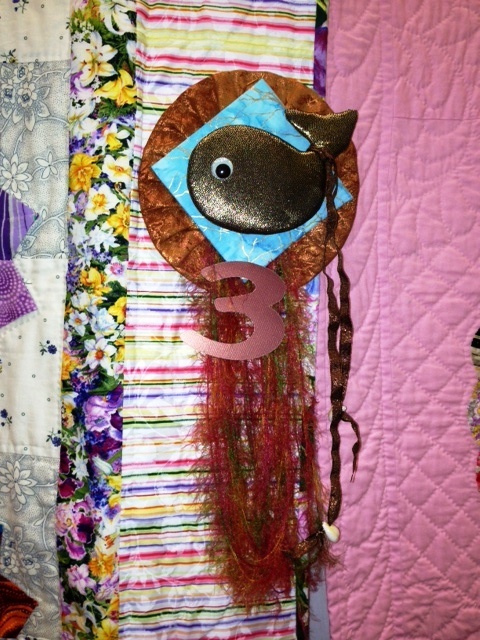 This is the weekend of the 20th annual quilt show put on by Sea Pals, the quilt club in Ocean Shores. I have been a member of this group for 12 or 13 years, though I haven’t been active since Seneca and Raven’s school schedule has made it impossible to be at Ocean Shores during the week when they meet. 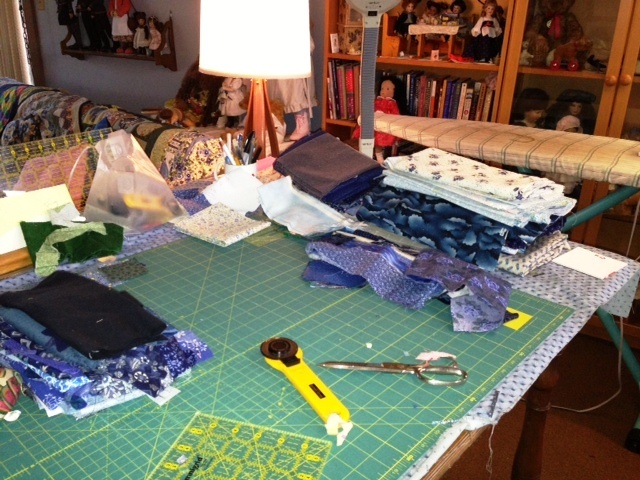 I have recently joined the club in Sequim and am getting acquainted with Sun Bonnet Sues there. 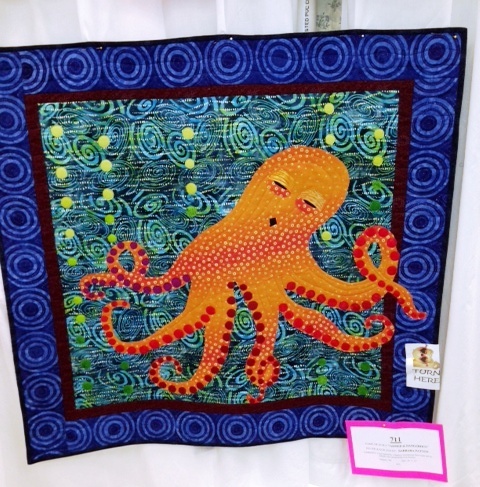 But I decided to enter the Sea Pals quilt show one more time. There were over 200 hundred quilts on display, and I was very surprised this morning to see that my Liberated Dresden Plate quilt won third prize in viewer’s choice for the hand quilted category. This is the quilt that took me three years to finish due to my broken arm. 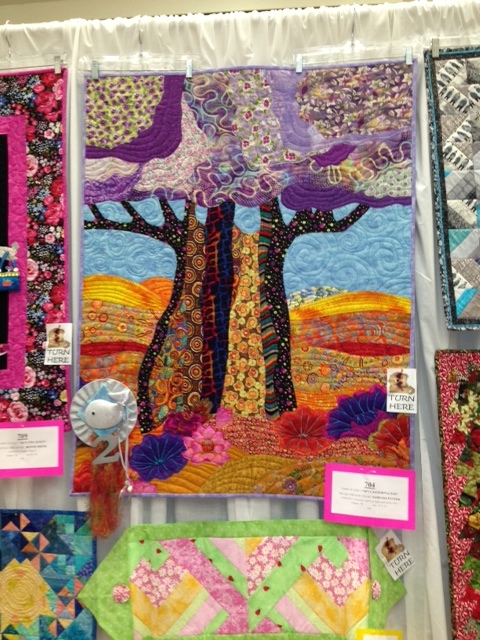 My friend Barb also won a prize, second place for her art quilt, which is an Oak Tree in wild colored fabrics. It has been very rainy here this weekend. 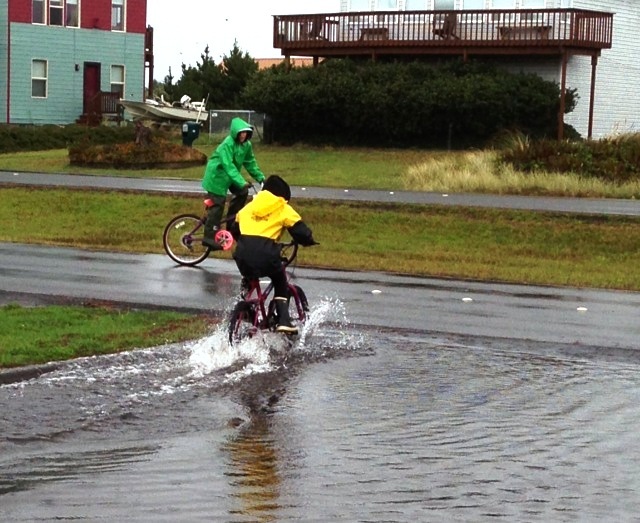 The kids finally went outside to ride bikes in the puddles. I sewed the binding down on this quilt that will be given to to someone who needs it. 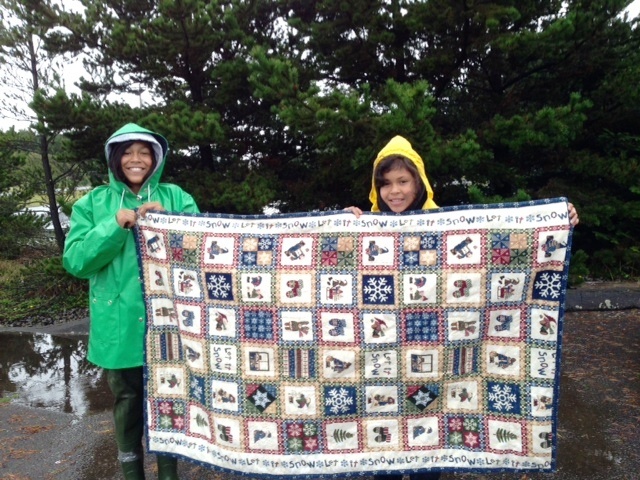 I had them pose with a Community Quilt I hemmed for the Sun Bonnet Sues group, they give away many quilts each year to people who need them. 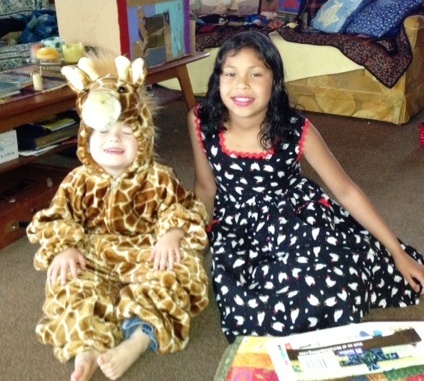 Seneca and our little foster boy then tried on Halloween costumes in anticipation. 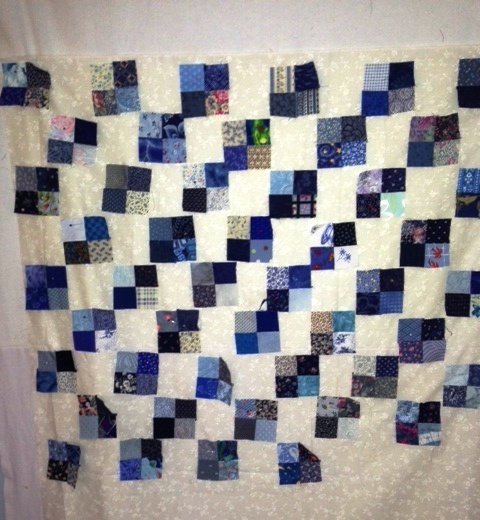 Ted replaced the garbage disposal and I worked on a new project, a blue and white quilt made with blue scraps. Blue block quilt is well well started. I am well on my way! I do love scraps. Larry has been a foster child in our home for almost a month. He is nearly four years old and has many delays, the most significant being his speech delay. But it amazing to see how many new words he is able to use now. He hardly spoke when he came though he certainly knew how to scream, which he did whenever he felt frustrated. And this was often as he did not have the language to say what he wanted. But he is starting to break out of that cycle because he can now express many of his “wants” using words. Settling himself on the couch to read. 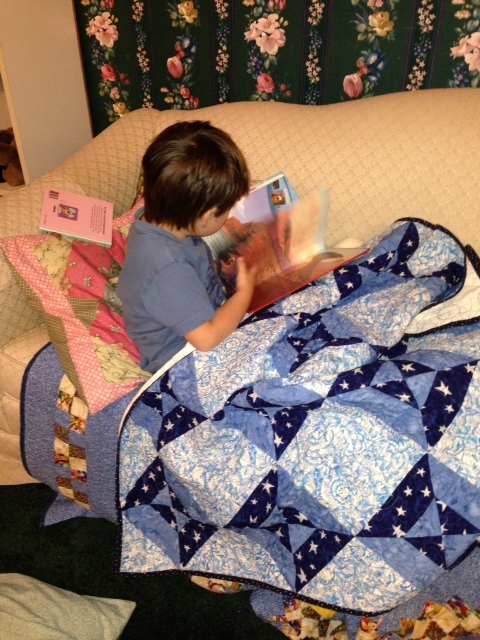 Notice the new quilt that a friend made and gave to him. 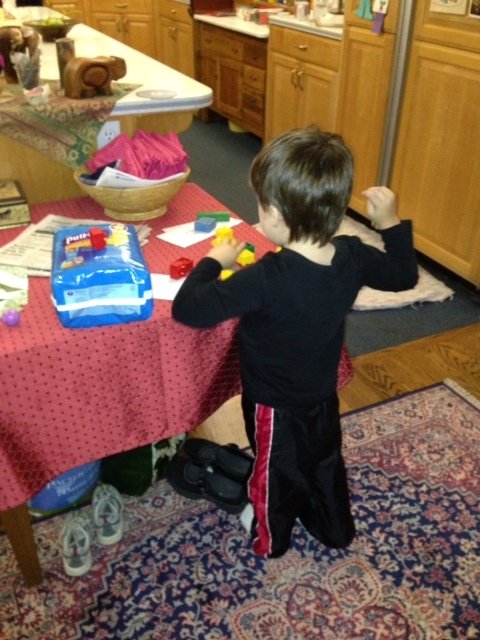 In many ways he is a typical little boy, he loves to play with cars and trucks and well as to build with blocks. He will eat anything covered in peanut butter and he loves to ride in the car. And he had a great time camping. But traumatic early experiences have caused damage that could be very hard to overcome. He loved camping. 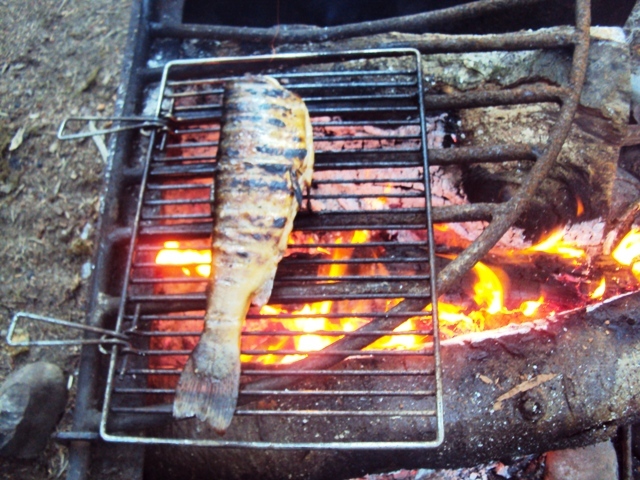 Here he is waiting for his turn to sample fish cooked over the open fire. He loved it. Ted serves and Seneca looks on. Our family has cared for more than 40 foster children in the past three years, most for just a few days. They have ranged in age from a few days to 17 years. We see our job as helping kids who are in crisis to begin to feel safe and comfortable while a more permanent placement can be found for them. Some return to their parents and some go to grandparents or other relatives. And some, like Larry, will go to long term foster homes, now that it is clear that he can’t return to his mother for awhile. She will be offered services and encouraged to visit on a regular basis. People often ask if it is hard for us to let the children go when the time comes. Larry is visiting his new foster family over the weekend and I have more of a sense of joy and anticipation than sadness. I feel good about what we were able to help him accomplish. He is calmer, more social, and has better table manners. He now likes to be read to, and he screams less. He is able to make eye contact sometimes and he follows simple directions. We know that family that will be taking him and believe he will do well there. I took him to appointments with the folks at Head Start and the preschool program through the school district that provides support for kids with delays. He qualified and is now enrolled in both programs. With calm stability in his life I think he will begin to make amazing gains. Due to privacy concerns I couldn’t use photos of his beautiful face. He has blue eyes to match the quilt in the first photo. I have also changed his name in this blog. This addition was written Saturday evening. Larry is back. His prospective foster mother called around noon. Larry bit her foster daughter and twice bit her granddaughter. He had provoked their dog to bite him and she said she was in over her head. He is asleep now, I am so sorry for him, and I wish it had worked out. It looks like he needs a family with no little kids and no big dogs. 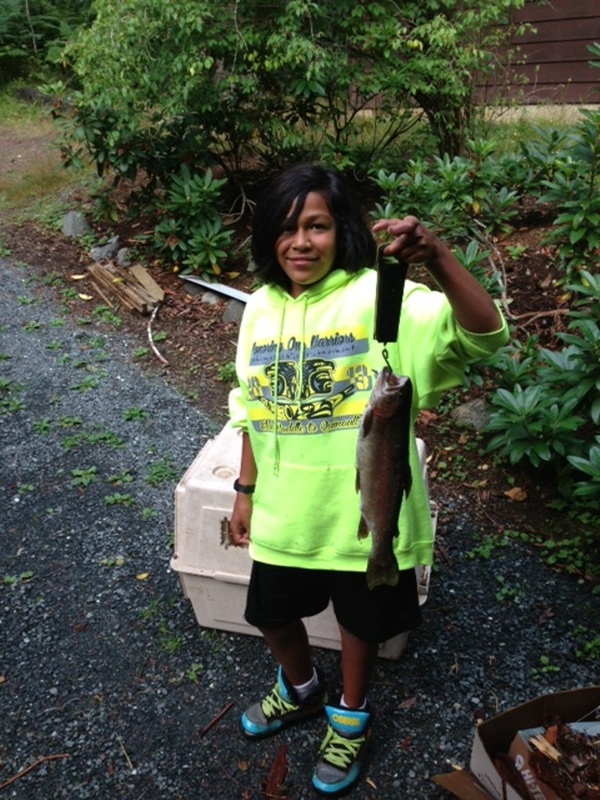 Raven has wanted to be a fisherman for a long time. He has talked about salmon returning to the Elwha River and wonders if any will make it to Lake Dawn. 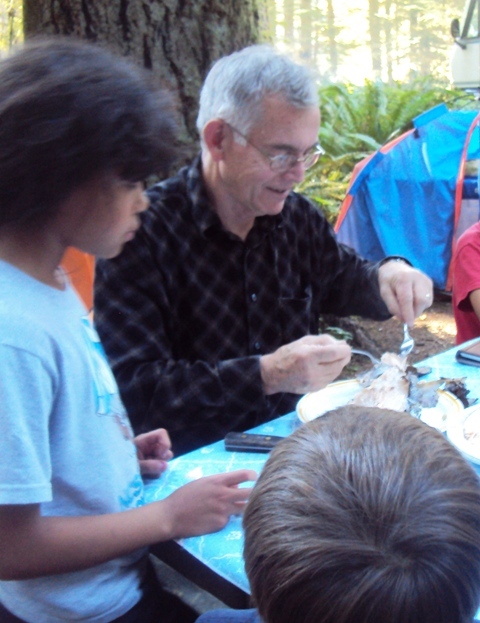 This summer he scoured garage sales for fishing poles and tackle. And he gathered quite a collection. 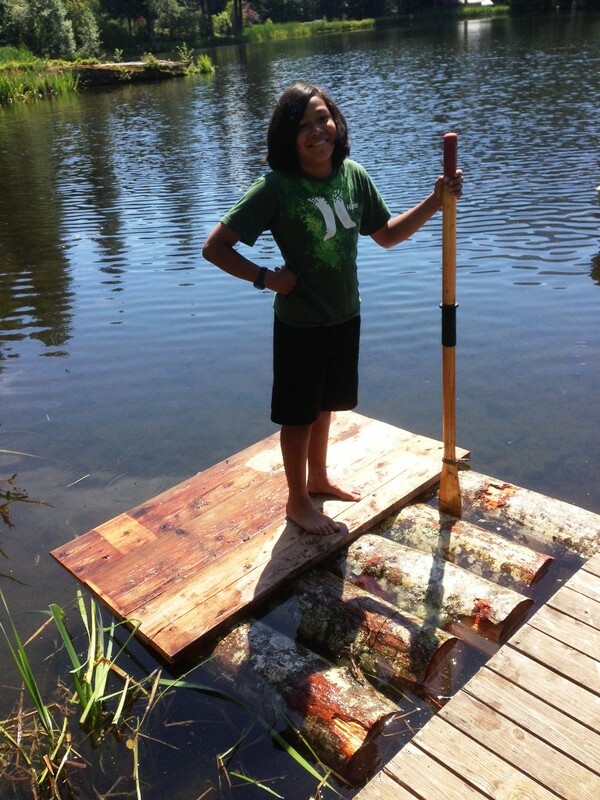 Though we have a little row boat and a canoe, he wanted a fishing raft. I think he was inspired by my stories of the raft I had as a child. 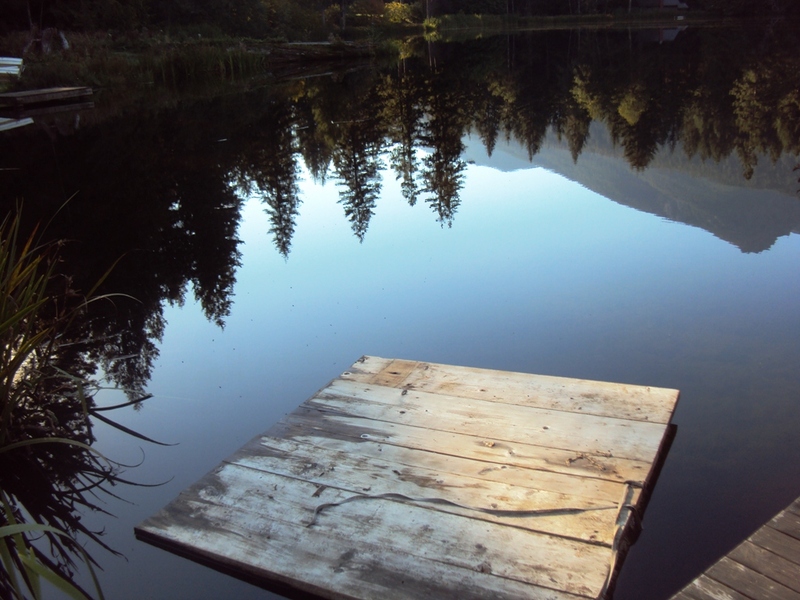 He had very detailed plans for a raft in his head, and finally he and Ted cut down an alder snag on the back of our property, cut it to lengths and made a little raft. It rides low in the water and can be poled into position. 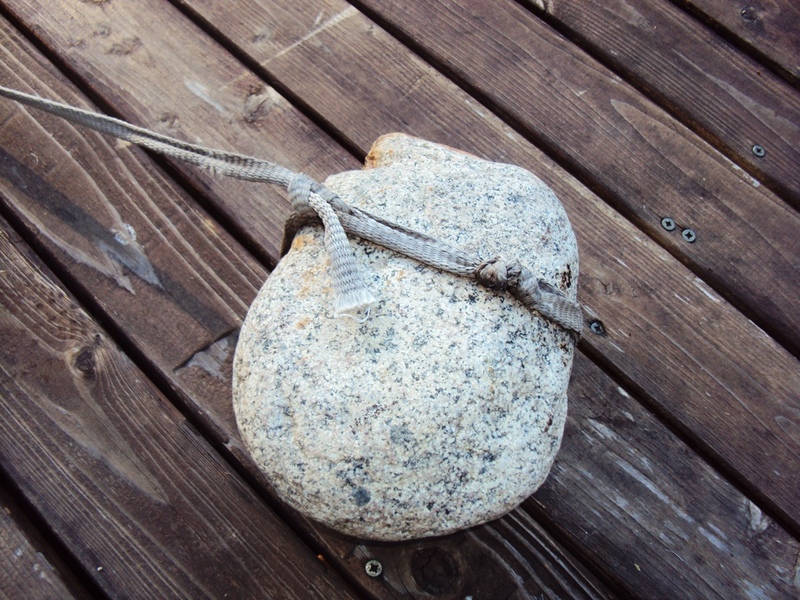 He fashioned an anchor from a rock and a rope. He was set. 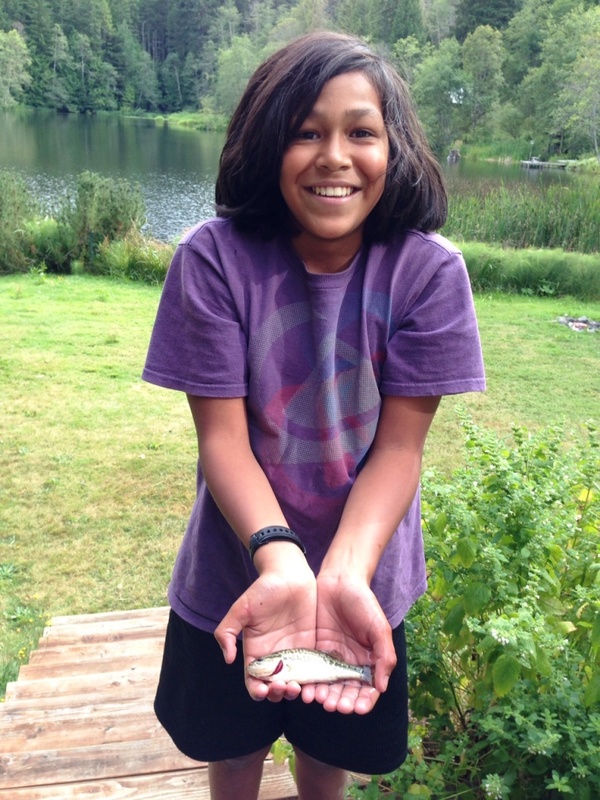 He began casting and could hardly have been more excited when he caught his first fish, though it was small. He had his photo taken, then put it back in the lake and watched it swim away. He learned to tie knots to hold his hooks in place and tried various little spoons, graduating from garage sale tackle to spoons from Swains. It was strictly “catch and release” thank goodness. 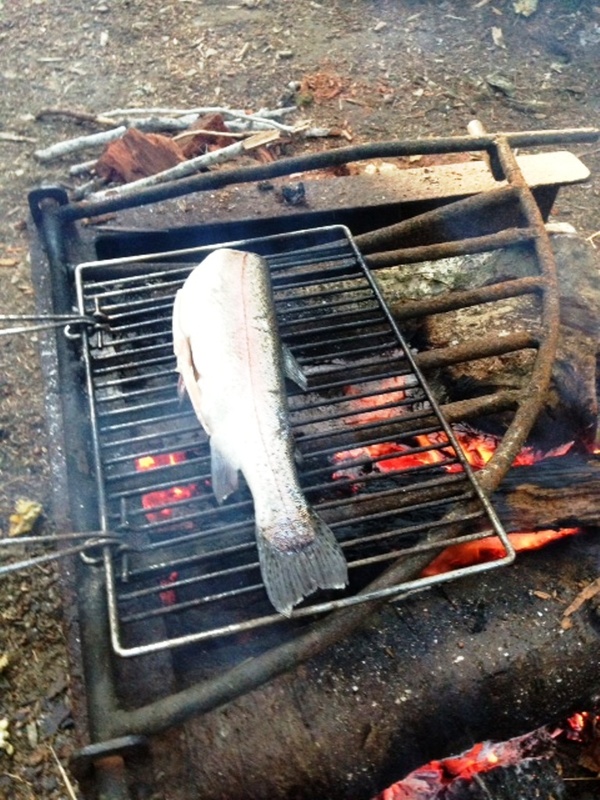 But last week he caught a 17 inch trout! When he put it back in the water it went belly up and didn’t move further. He decided we would eat it. 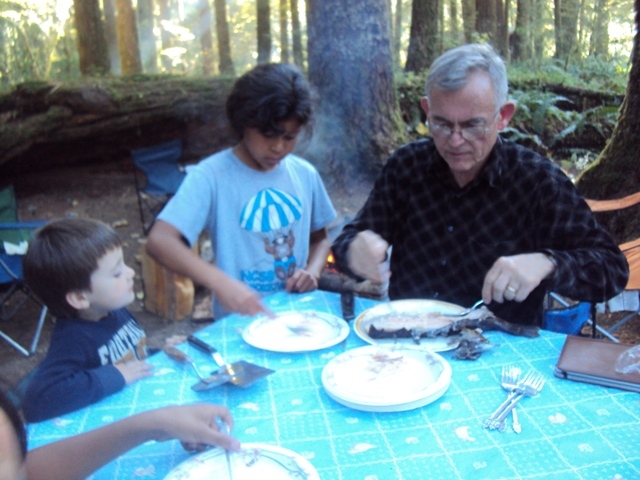 He and Ted cleaned it and since we were going camping the next day, they decided to cook it over an open fire. 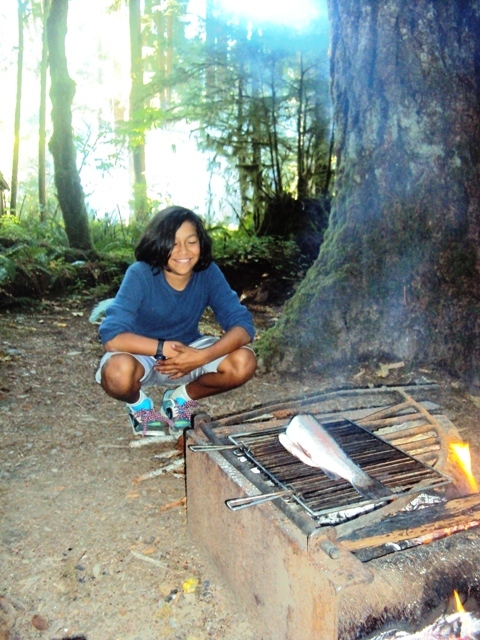 He is a picky eater, but this was his own fish–he loved it and soon there were only bones left. Lake Dawn is privately stocked and since we are not fishermen, we haven’t been involved. But next time it is stocked, we will plan to contribute!